Startup founders always have more to accomplish than they have time for. Local support networks, which are intended to be helpful, can present a bewildering array of options. Should you attend that evening networking event? Should you try to meet as many local ecosystem stakeholders as you can? Apply for the latest pitch competition? Take that early-morning coffee request? Our latest research on Local Connectedness has determined that the answer to these and other questions is a resounding “Yes.” But, not all forms of networking are created equal. 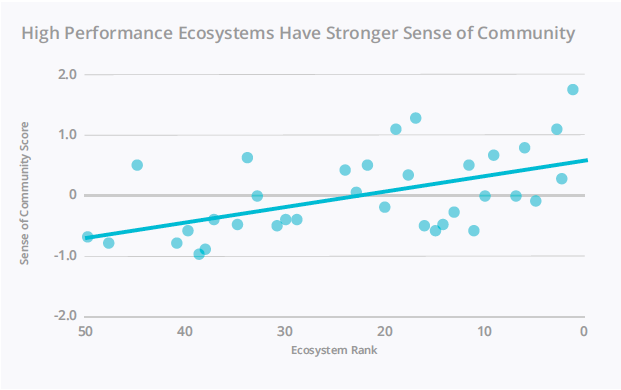 In our 2018 Global Startup Ecosystem Report, we found that Local Connectedness—especially relationships with other founders—is strongly associated with higher startup performance. Just as importantly, not being locally connected is strongly associated with lower startup performance. Beyond relationship-building, a healthy Sense of Community fostered by founders helping each other is highly correlated with overall ecosystem performance. What Does Local Connectedness Mean? Prior research, the lessons of common experience, and the practice of economic development have led to two presumptions about Local Connectedness: (1) being connected to local networks is important for entrepreneurs; (2) physical proximity strengthens those local networks. Mostly, analysis and practice have assumed reducing distance between people will lead to more connections and more success. Sense of Community — “People helping people.” We asked startup founders and executives about the ease of seeking and receiving help and introductions from other founders and investors. Collisions — To determine whether the notion of Collisions (serendipitously running into others from the startup community) matters, we asked startup founders and executives about their engagement with others in the community and their attendance at events. Density — This sub-factor captures how closely startups work with other startups, either in the same office or in a coworking space, and how close founders and executives live to their office location. What we found is that while there seems to be a chain of causation among these elements, they do not all matter equally for startup success or overall ecosystem performance. Density—with lots of startups working (and sometimes living) near each other—helps create Collisions. Those Collisions, in turn, help develop Local Relationships and a Sense of Community; the Collisions sub-factor is highly correlated with these. On its own, however, the Collisions sub-factor has low correlation with ecosystem size, and only a slight correlation with ecosystem rank. It’s not the fact of event participation and community engagement that helps an ecosystem—it’s the relationships that Collisions help create. 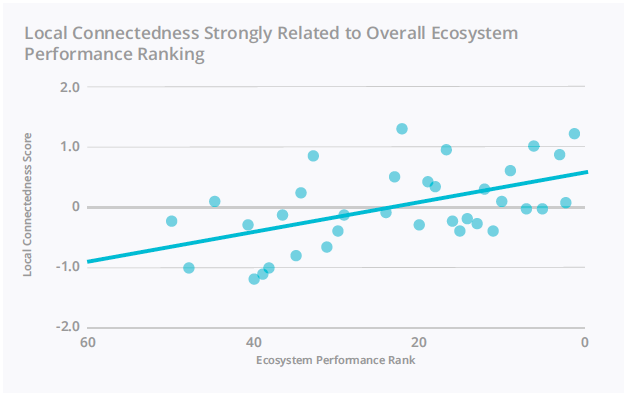 Overall, Local Connectedness correlates strongly with overall ecosystem rank, which reflects our analysis across nearly one hundred metrics (although the Local Connectedness sub-factors have not yet been included in the ranking analysis). Using these Local Connectedness sub-factors, we classify founders as being high, medium, or low connected in their ecosystems. We find large differences in startup performance across these categories. Highly-connected founders, in particular, enjoy a higher rate of success in their startups. While we cannot say definitively that high Local Connectedness of founders causes better startup performance, our robust findings here are certainly suggestive. We looked at two measures of startup performance: employment and sales. For overall Local Connectedness, startups with low-connected founders have, on average, lower employment than startups that are better connected. Surprisingly, startups with high-connected founders are often younger companies: they are building local relationships early on and growing faster in size. Which dimension of overall Local Connectedness is most associated with startup performance? A higher number of Local Relationships—with other founders, investors, and experts—is correlated with higher sales, as shown in the table. Founders in the “high” connected category outperform the medium- and low-connected in sales, and the high- and medium-connected founders come from slightly younger startups. These results don’t necessarily mean that being well-connected locally causes startup growth. Another consideration may be that founders who are not plugged into local networks (and thus fall into our low-connection category) might be focusing on Global Connectedness because of the type of their company. Or, perhaps these founders are spending their time building their company rather than networking. But what is most striking about our analysis is the consistency of the positive relationship between a high-level of connection and startup performance. Clearly, there can be no free-riding by the unconnected: almost without exception, the lowest-connected founders are behind in terms of company performance. Does Local Connectedness Boost Ecosystem Performance? Sense of Community does correlate highly with indicators of overall ecosystem performance such as Startup Output, exits, startup valuations, exits, unicorns, and ecosystem value. A higher level of Local Relationships is also positively correlated with ecosystem performance. This correlation is driven mostly by the individual metric of Founder Help—defined as founders helping founders, providing advice, introductions, or perhaps just a sympathetic ear. When founders help other founders, overall ecosystem performance is stronger. A strong Sense of Community emerges from Local Relationships, and is based on the quality, not necessarily the quantity, of those relationships. Yet the relationship between Sense of Community and Local Relationships and overall Local Connectedness is not always straightforward, and varies by ecosystem. Importantly, Sense of Community is unrelated to ecosystem size, whereas Local Relationships, as a sub-factor in ecosystem assessment, is a function of size. In larger ecosystems, with more founders and more investors and more supporters, there are simply more people to meet. But giving and receiving help among founders—Sense of Community—is not a function of that. A large ecosystem with a high number of Local Relationships could have a low Sense of Community, and the latter is more strongly correlated with startup success and ecosystem performance. Greater Helsinki and Jerusalem, for example, are both small, strong startup ecosystems, with similar levels of Sense of Community in our analysis. Incidentally, Greater Helsinki has a higher level of Local Relationships (among founders, investors, and experts) than Jerusalem. We also looked at Density—a term that captures whether startups in a given ecosystem work in a coworking space or an office with other startups, and how far founders live from their office. Initial analysis failed to find any significant relationships or correlations between the Density sub-factor and our measures of startup success and ecosystem performance. Density metrics correlated fairly well with the Collisions metrics (not surprisingly), but that was it. Because of this, we removed Density from the overall Local Connectedness Success Factor. What this tells us is that relationships and the assistance that is shared between founders is a greater factor driving startup success and ecosystem performance than mere physical proximity. Sense of Community and Local Relationships are what ecosystem leaders should care most about, rather than trying to cram everyone into a single physical space. No matter how many startups work next to or near each other, if they don’t help each other or even really know each other, their companies (and the ecosystem) will suffer. Look for further insights like this in the upcoming 2019 Global Startup Ecosystem Report!